The common treatment for asthma starts with avoiding the things that trigger your asthma. Of course the first step in treatment is to simply stay away from the substance that is causing the asthma attacks. For example, if you know you are allergic to secondhand smoke, you stay away from areas where there may be a lot of secondhand smoke such as public areas. Not all cities across America have a ban on smoking in public areas. Then after this, treatment plans will vary among asthma sufferers. The most common treatments for persistent asthma sufferers are long-term use of medications (corticosteroids) to prevent the attacks and quick relief medications for when the asthma attack is in progress. These are inhaled medications and people will have a little hand held inhaler for that purpose. These medications are designed to prevent asthma symptoms. They reduce the amount of inflammation and mucus in the air passageways. They may take several weeks before the affects are felt. They are not anabolic steroids that you often hear about in the media. Corticosteroids are given in low dosages and have the side affects of thrush (yeast infection in the mouth) or hoarseness. Some of these medications include: Fluticasone (Flovent Diskus), Flunisolide (Aerobid), and beclomethasone (Qvar). Long acting beta-2 agonists are also called bronchodilators and their purpose is to open the air passageways and to reduce inflammation. 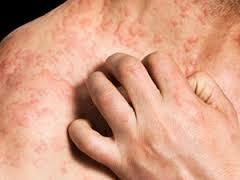 They will be used in combination with corticosteroids when the asthma symptoms are persistent. Like the corticosteroids, they are not prescribed for quick relief medication against an attack in progress. Some of the brands available are: salmeterol (Serevent Diskus), and formoterol (Foradil Aerolizer). Leukotriene modifiers are also inhaled medications used to open up air passageways and reduce swelling or inflammation. Leukotriene modifiers are the second choice after the corticosteroids. The brands often prescribed are montelukast (Singulair), zafrilukast (Accolate) and zileuton (Zyflo CR). 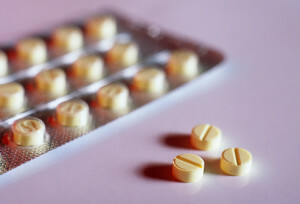 Cromolyn and nedocromil prescribed, as Tilade are inhaled drugs to reduce asthma symptoms. They are also a second choice after corticosteroids. Theophylline is a bronchodilator, which opens the air passageways by relaxing the muscles. It is taken in a daily pill form. 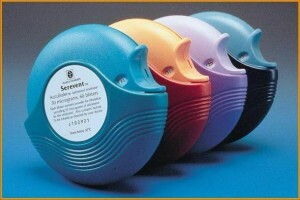 Quick relief medications are also called rescue medications are used when you are having an asthma attack. These medications are designed for short-term use, and can often be used prior to exercising which is a known asthma trigger. Use these medications only when your doctor tells you too because they can interfere with your long-term medication. Short acting beta-2 agonists are bronchodilators and act with in minutes by opening up the air passages and relaxing muscles. These medications include albuterol. Ipratropium sold as Atrovent, is an anticholinergic medication, which does the same thing as the bronchodilators. This medication is most commonly used for chronic bronchitis and emphysema. These medications are prescribed for severe asthma symptoms and asthma attacks. These medications contain prednisone and methylprednisolone and must be used cautiously as they have severe side affects. 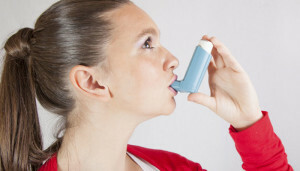 Medications for asthma brought on by allergies. If you have airborne allergies such as allergies for pet dander or pollen you may also have to take allergy medication as well. Immunotherapy shots are given on a weekly basis to build up the tolerance towards the allergen in question. These medications also build up the body’s immune system tolerance. They include such drugs as omalizumab (Xolair). Xolair is also given by injection. Sometimes people will have to try different medications until the doctor finds the right one for them. The proper medication also depends upon your age, your symptoms, the severity of your symptoms and what works best to keep your asthma under control. Asthma does change over time and you must always work with your doctor who will monitor your symptoms and create an asthma action plan for you. How does Weather Affect Asthma?